Doctors appointments are not fun but since my appointments are at such awkward times it means I get to do a little bit of shopping downtown in between appointments. 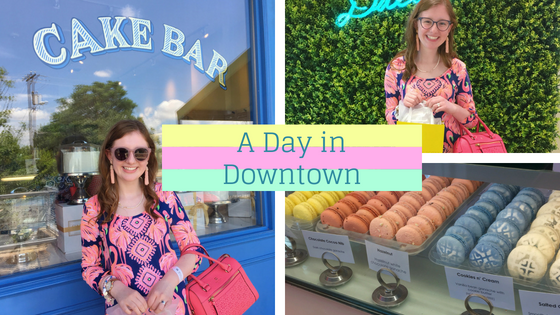 Here are some pictures from one of my fun shopping day! My mom and I started off the day at Bread Winners for breakfast. I got the cinnamon roll french toast and my mom got the banana bread french toast and they were both fabulous! After breakfast there was still a little bit of time before we had to be at the hospital so we went and walked around the West Village. I splurged and made a fun little purchase in Kendra Scott and got the gold drusy Elisa necklace. After my appointments we went to Trinity Groves and went in the Cake Bar and Kate Weiser Chocolate. Trinity Groves is a restaurant marketplace filled with fun restaurants and dessert places. The Cake Bar was super cute! The store was a pretty blue color and had rows of cakes to choose from- I chose the key lime cake, it was delicious! Kate Weiser Chocolates is a chocolate place where their desserts are hand painted! The chocolates look like painted rocks, they are almost too pretty to eat! I also got some macaroons while we were there and they too were amazing! I had to take a picture with the bridge-to-no-where in the background.